It's been a while since I featured a breakfast-themed recipe and pancakes were a high priority for me to document. I doubled the sugar and added vanilla and nutmeg to my usual pancake batter to compliment the blueberries and it really paid off. They were sweet, flavorful and hardy - something I expect from a pancake breakfast. I also have to thank the citizens of Olney in the U.K. for keeping a bizarre tradition alive for the last 500 years and making the introduction very easy and interesting to write. The blue plate in the final shot really makes the blue colors of the berries and pancakes pop. I've wanted to use the plate for a while, ever since I picked it up at the Dollar Tree a few months back - it is almost as if the plate was destined for blueberry pancakes! The recipe is two stages: making the batter and cooking the batter. The presentation reflects this well. If I had to choose my 5 favorite recipes by design alone this would make the list. 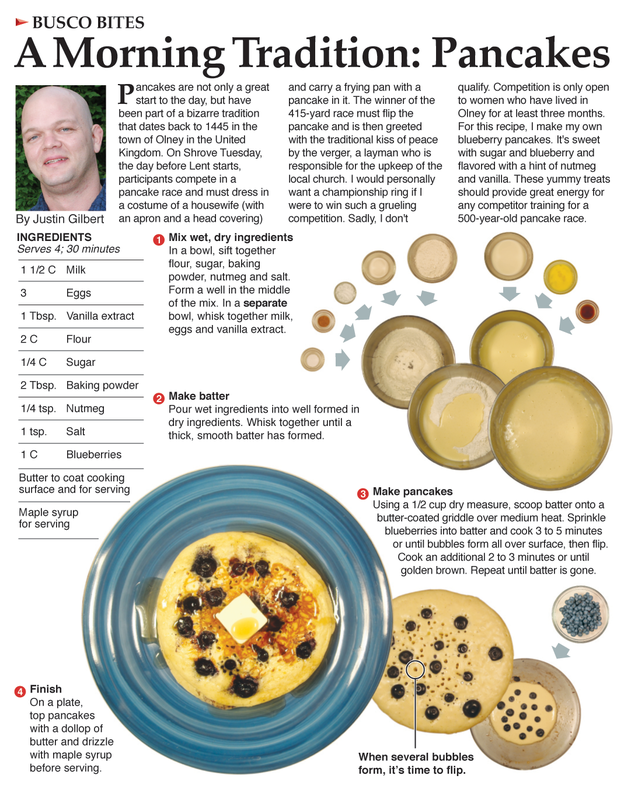 My favorite part of this recipe is using a pointer to isolate a bubble in the pancake. It is THE cue that it is time to flip. A first time pancake-maker could look at this recipe and know exactly when the time was right to turn the pancake. Often it is a detail like this that many cookbooks don't provide -- and it can make cooking so intimidating to a beginner. Overall, I think this is one of my finest recipes to date. So many things came together - the plate color, the two stage process and the handy detail about timing the pancake flip. Not to mention a 500-year-old tradition in the U.K. that helps make this one a real favorite of mine.